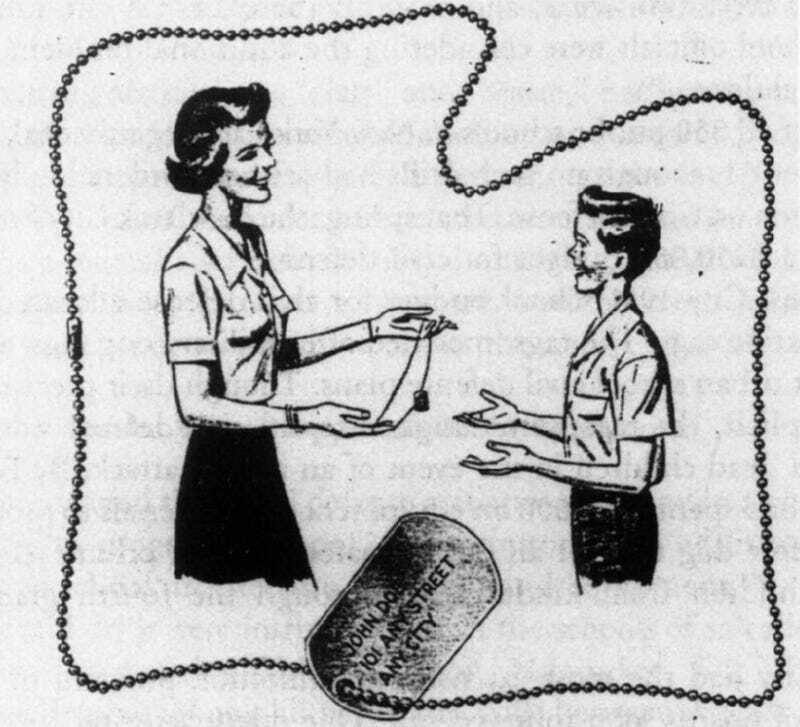 In the early 1950s cities across the U.S. spent hundreds of thousands of dollars outfitting their children with military-style dog tags. Why were we giving kids something that’s usually reserved for people at risk of dying horrifically in the line of duty? Because in the era of duck and cover, kids were on the front lines. The Soviet Union surprised the U.S. and became a nuclear-equipped superpower when it successfully tested its first atomic bomb on August 29, 1949. Suddenly the world had two ideologically opposed countries with the capability of unleashing unprecedented devastation upon each other. The campaign to mobilize average Americans by normalizing the discussion of collective death (even with children) was under way. In February of 1952 the city of New York bought 2.5 million dog tags. By April of that year, just about every kid in the city from kindergarten to fourth grade had a tag with their name on it. Kids in many other cities like San Francisco, Seattle, Las Veagas and Philadelphia also got dog tags, allowing for easy identification should the unthinkable occur. But educators weren’t considering just dog tags to identify the scores of dead and injured children that would result if the cold war suddenly turned hot. They also considered tattoos. Tattooing is considered occasionally, but generally rejected because of its associations and impermanence in the case of severe burns ... Marking of clothing is more seriously regarded [but] clothing can be destroyed... and is frequently interchanged. Fingerprinting is... regarded by some as an infringement of privacy... Cards are easily worn out, stolen or destroyed. Did you catch that? Fingerprinting children: a terrible invasion of privacy. Tattooing children: well, the only downside is that the tattoos won’t be legible when all their skin peels off in a nuclear blast. Somehow I missed that episode of Leave it to Beaver where the Beav gets a tattoo for corpse identification purposes.